They've been at it for nearly a year and they ain't stopping now! The previously allocated funds may be gone, but that doesn't mean the city's plans for a helipad at San Francisco General Hospital are dead, too. Best way to tell? The "Stop the SF General Hospital Helipad" people are back at it, and this time with a little more photocopying power. See SF Citizen's recent run-in. 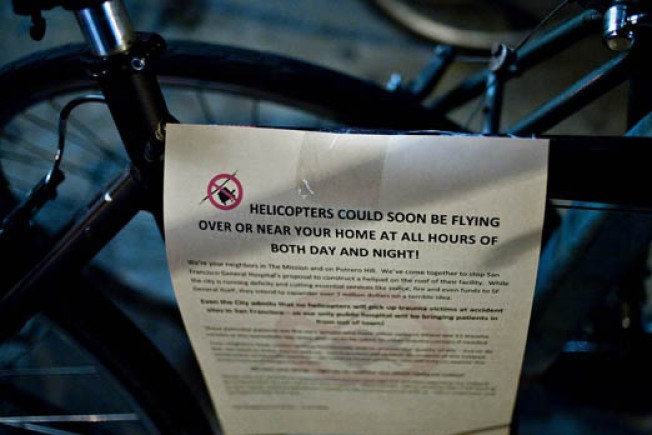 "HELICOPTERS COULD SOON BE FLYING OVER OR NEAR YOUR HOME AT ALL HOURS OF BOTH DAY AND NIGHT!" Saving lives! The noisy horror! SF General may be the only Level 1 Trauma Center in the country without one, but that argument seems to fall flat when the pastoral Potrero quiet is at stake. Wonder how they coped with the Blue Angels?